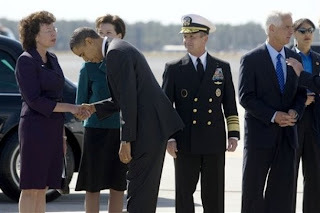 Here is video of President Obama arriving in Tampa, Florida on January 28 which appears to show him bowing to the Mayor of Tampa, Pam Iorio. She was there to greet him at McDill Air Force Base. The bow appears to happen at the 1:07 mark of the video.